TechTribe revolves around the concept of Tribers (aka members) and Tribes (aka communities). Tribers connect with each other via Tribes that can be, say Ruby on Rails developers in New Delhi or Web Designers in India or just Technology Bloggers who follow Google. While you can have connections and communities on almost every other social networking site on the web, TechTribe is purely limited to the techie community of India and so the signal-to-noise ratio is is pretty high. Other than the regular profile, you can add a portfolio to showcase your professional achievements like any software that you have designed, projects that you have worked on, whether you have consulted companies, received or imparted training and so on. There are a few other interesting concepts that are unique to TechTribe and one of them is GrassRoots - it's like raising issues by signing an online petition. The advantage here is that your feedback "will be" passed to the concerned company/person by TechTribe. 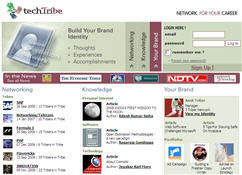 So if you are not satisfied with the service of Reliance Infocom data cards or the BPO policy of NASSCOM, add your rant to TechTribe Grassroots and it will be passed anonymously to the concerned people for them to act upon it. Their responses will also be shared with you. There's also an easy option to import any existing blogs/RSS feeds in TechTribe.